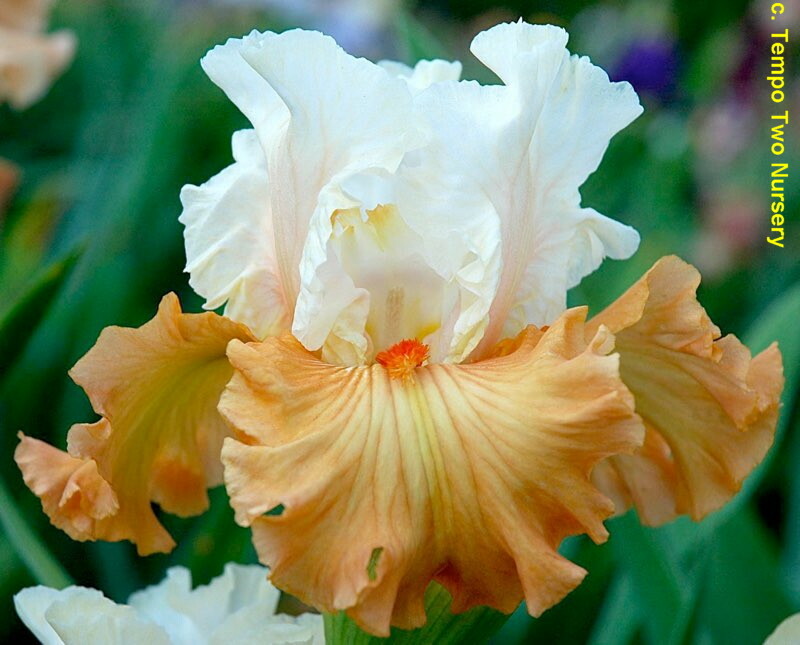 'Almost Famous' (Barry Blyth, R. 2015) Seedling S76-3. BB, 22" (56 cm), Early to midseason bloom. Standards creamy white, cream edge fading after first day; Falls medium apricot, blending apricot lines radiating out from hafts; beards tangerine; slight sweet fragrance. Keppel 00-163A: (('Champagne Frost' x Shoop 91-15) x (('Amber Snow' x Ghio 88-180P, Snowed In' pod parent))) X 'Sweetly Sung'. 2015/16 Tempo Two. From Tempo Two catalog 2015: ALMOST FAMOUS (Blyth 2015 Aust) EM 23" Border Bearded. We called it Almost Famous because if this was a full sized Tall Bearded, it undoubtedly would have been famous. Gorgeous creamy white standards with a creamy edge, fading to white after the first day. The falls are medium apricot with blended apricot veining radiating out from the hafts. Beards are bright tangerine. Everything is in proportion to its height and there can be 3 perfect flowers out at once. It is fertile. Delicious! What a pedigree! ((Keppel 00-163A: ('Champagne Frost' x Shoop 91-15) x 'Amber Snow' x Ghio 88-180P from Puccini seedlings) X 'Sweetly Sung'). Sdlg No S76-3. $40.00. Can't INCLUDE 'AdmBbInsert"', path is empty or contains illegal characters. jpg almostfamous3.jpg manage 76 K 31 Dec 2018 - 14:07 Main.TLaurin Photo by Iris Sisters Farm.